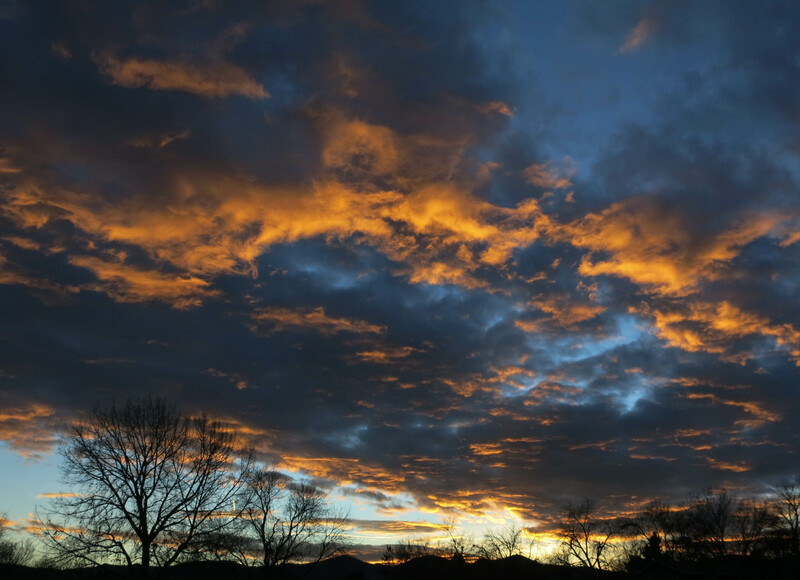 Greetings and salutations, everyone; yes, once again it is I, Mani the purebred border collie, filling in for the guy I live with, and here this evening to show you pictures of the sunset, as well as some other things. You may remember me from such posts as “The Ugly Garden”, among so many, many others. Here I am in a characteristic pose. I got a new toy. This picture was taken this evening. The toy isn’t really as big as it looks; some odd camera thing. The guy I live with got me three new toys a few days ago, because he said there were some which needed to be replaced, because they had been “chewed out of all recognition”. I’m not sure who by. Last night a bunch of paper was burned in the chiminea as it was snowing. I talked about that yesterday. There was even a wood fire, but the guy I live with put that out after the paper was all burned. There were times when he just happened to glance at the poetry and prose printed on the paper, and suddenly feared this might be a mistake. He kept putting paper in, as it snowed. But this morning things were completely different. Maybe you can see, in the bird bath, that it didn’t even freeze last night, and the snow had all melted. The weather here can be weird. 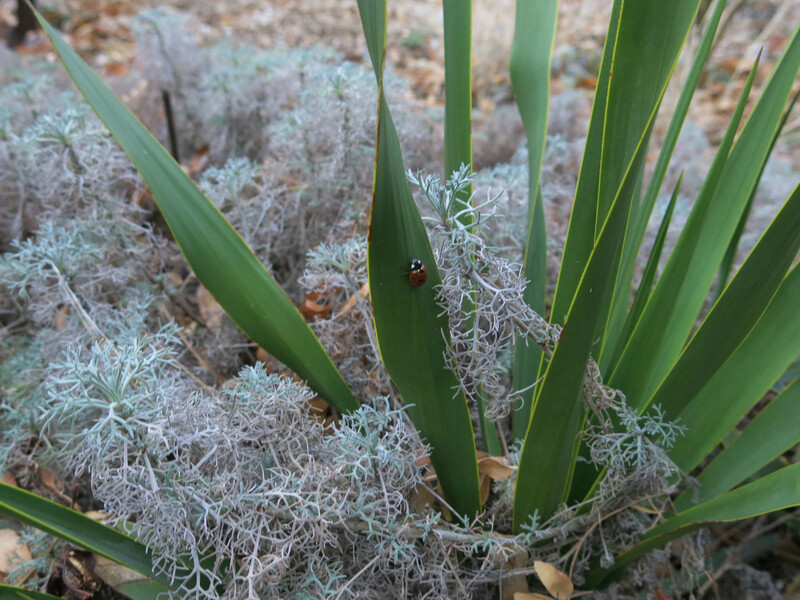 The guy I live with went to the store, and when he came back, there was a ladybug on the Yucca rupicola. The guy I live with told me that ladybugs bite, and so I give them a wide berth. That’s easy to do, because ladybugs are little. I had my dinner, which was very delicious, as it always is, and then I had a biscuit, which I decided to eat out in the back yard, because it was so nice. Biscuits in bed is even better, maybe times a million better, but out in the back yard is good too. 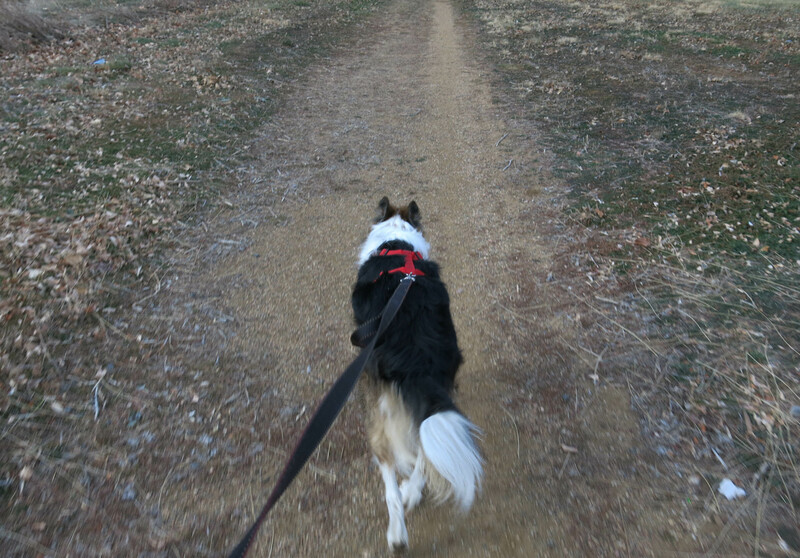 Then we went on our walk. There was an awful lot of me just standing around while pictures were taken, but the guy I live with said it would probably be a nice sunset, and it was. He posted a picture on Facebook but these will show up much better, as you can see. The sunset was even more spectacular than the pictures show. There was a dry wind blowing, too, which made it a really nice evening. The other thing I wanted to talk about is something pretty different. I guess talking about different things is turning into this month’s theme, and this isn’t something you might associate with the activity around here, and yet, in its own way, it is. The guy I live with is into paperwhites. 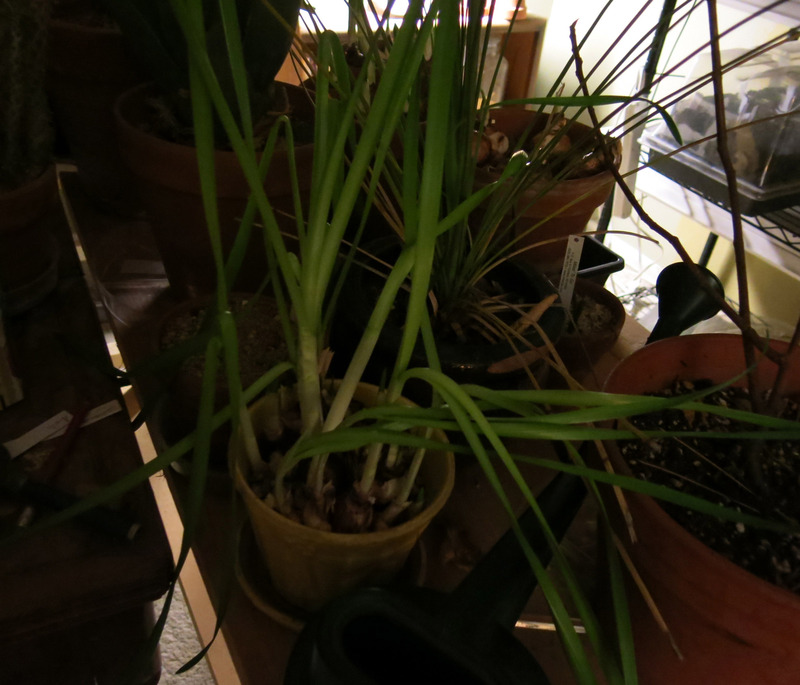 You know, cultivars of Narcissus papyraceus. Since he likes growing a lot of bulbs it might not come as a huge surprise that he also grows bulbs indoors. These are pots of the really common paperwhite, called ‘Ziva’, and also of some different ones, ‘Nir’, ‘Inbal’, and ‘Ariel’. Some people don’t care for the fragrance but the guy I live with says “Pfft”, which he says a lot, anyway. Naturally, there’s some weird experimenting which might not have any point to it. Some of the bulbs were just planted in pots of gravel and watered, which is the usual method, but when they flower and don’t get fed it sets them back. 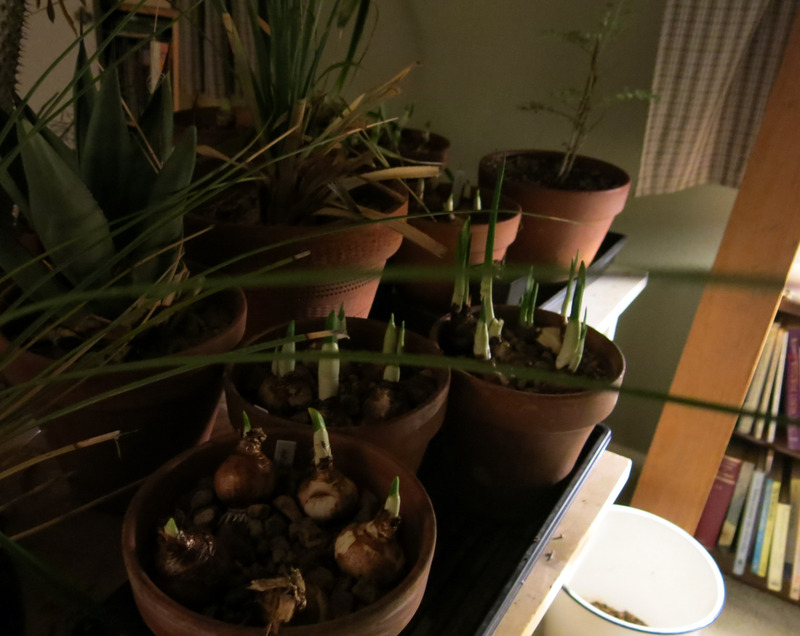 Others were planted in the soil-less mix used for everything, with the idea that the paperwhites could be fed more easily, and used year after year. Since they don’t get any nutrients if they’re just grown in gravel and watered, most people throw away the bulbs, which the guy I live with said was fairly senseless. The bulbs from last year aren’t going to flower this year because they didn’t get any food last year, but at least they’re still alive. They’ll get fed when the foliage starts to fade. And then if growing them in soil-less mix works, that’s the way it will be done from now on. 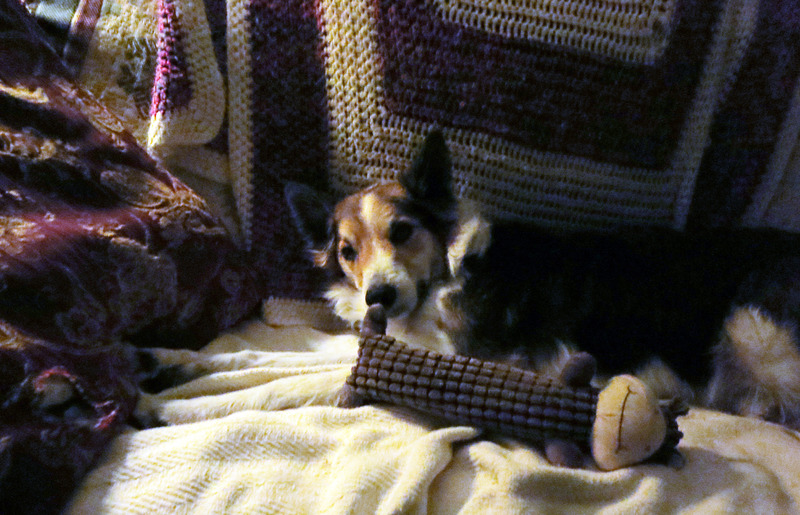 All that atmospheric lighting–I know, here I go again, but we purebred border collies can be easily distracted–comes from a fairly unusual source. This lamp came from his grandparents. It sat on a desk in the hallway, in their house in Los Angeles. On the same table sat a Model 302 desk telephone, the kind with the heavy receiver and metal dial. The guy I live with says that the only thing lacking from his memory of the desk, lamp, and phone was Humphrey Bogart sitting at the desk, talking on the phone, writing something in a notepad. Thanks to the “miracle of the internet”, the guy I live with did a search on this kind of lamp, and it was made by Moe Brothers Lighting, probably in 1951. So it’s, and I know this will be super hard to believe, as old as the guy I live with. The only difference is that the lamp still works perfectly. That really does wrap it up for tonight. I hope you enjoyed the sunset pictures, and, of course, the pictures of me. Wow! You never mentioned that you had a Yucca rupicola in your garden! That is pretty sweet! That is so awesome. I used to have 49 of the 50 known specie of yucca (without the varieties). There are a lot here, for sure. It is a fascinating genus! My favorite, Yucca whipplei has been reclassified as a Hesperoyucca though. Yep. The guy I live with says that one isn’t hardy here. Oh well. You wouldn’t like it anyway. It looks soft and nice, but has nasty sharp tips. It would have to go in the front yard, and there’s no room there, so it’s just as well. 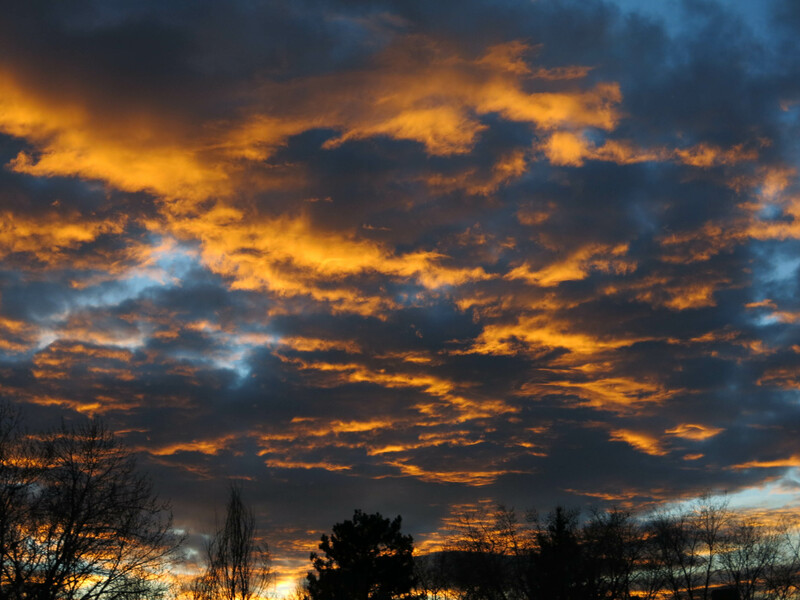 Heartfelt entries today and yesterday and beautiful sunsets as well. Thank you Mani and thanks to the guy you live with. Thanks. 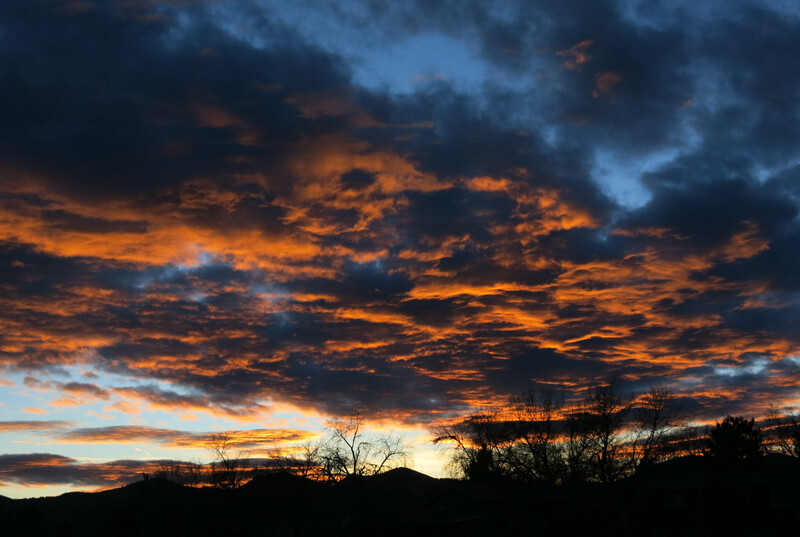 I can’t take credit for the sunsets, though the guy I live with sometimes does…..
Up in Los Angeles, Caravaggios are on special display. Last night’s sunset photos should be displayed in the foyer. I’ll tell them when I go up to see. You host plants indoors, Mani! Never knew that. The results of the great paperwhite experiment will be worth learning. I know a guy in Palm Springs who would go mad to possess that lamp. “Design value,” he’d say. 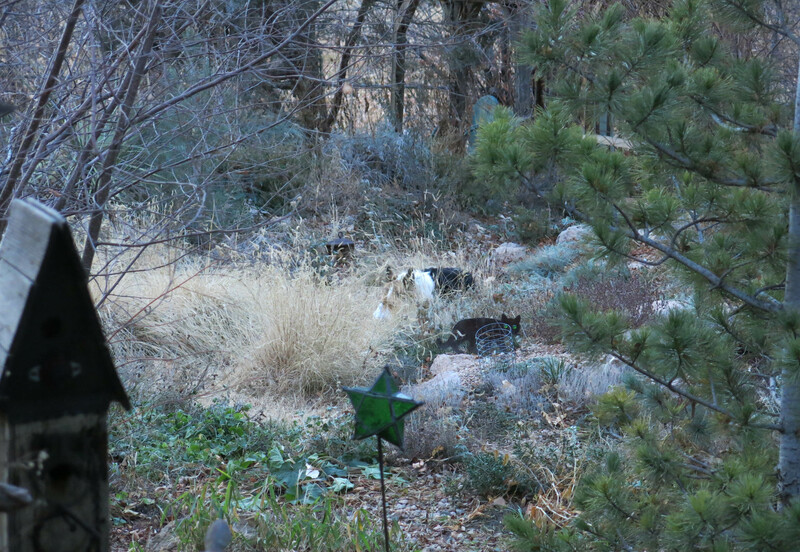 The backyard-biscuit- eating photo, comes near to being a holiday card, Mani, with you, French Cat, and the green star. Works for me. Enjoy your new toys and your splendid garden and your bed with soft Pottery Barn sheets. All the joy of the Season to you. Thanks; same to you. The guy I live with said we might have to get new sheets. I never knew they could wear out. He said something about them being “illegally chewn”, which made me wonder. The lamp is worth like fifty dollars if even that much. It makes a noise when it’s on. It might always have. It has that crinkled-metal finish that probably has a name. The guy I live with’s parents had a slide projector, one slide at a time, probably was a miracle of technology when it was made, that had that finish, too, like so many things from back then. The projector got really hot and had a smell to it, not bad, just a smell. Backyard biscuit-eating is excellent. The guy I live with says the equivalent of eating blinis and caviar on the terrazzo late in the morning, with (of course) champagne. I like that lamp. There must have been one in my past. It has a nice sense of familiarity. I love paper whites. Forgot to get some this year. 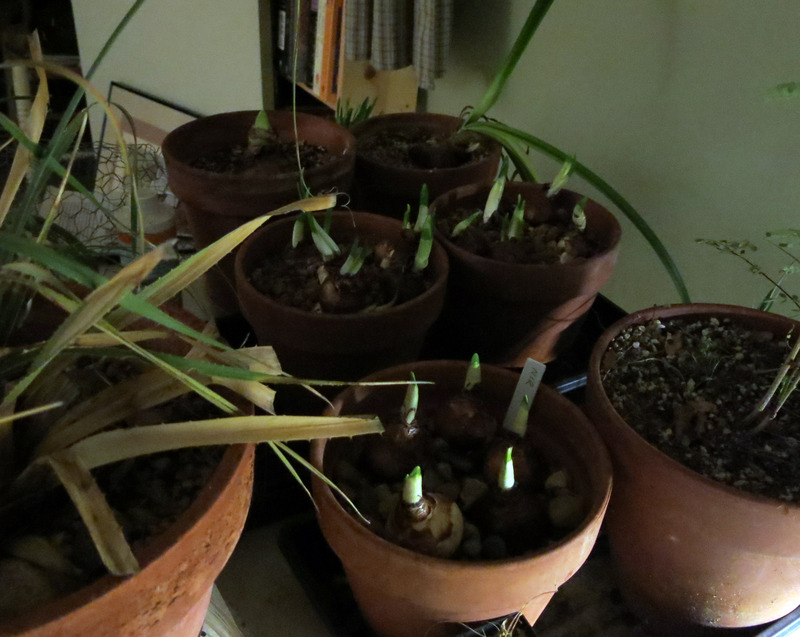 Probably not too late to get paperwhites. 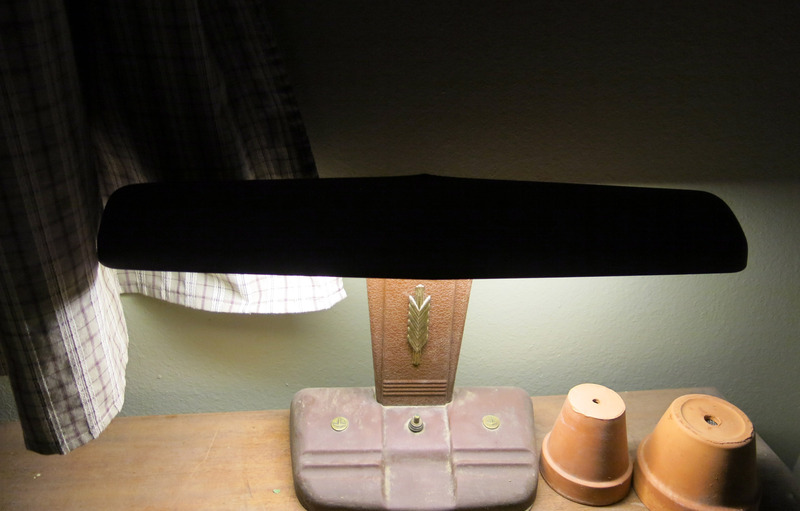 The guy I live with says that the lamp was probably widely available way back then. Way, way, way back then. Now that I read yesterday’s post….I’d have had a hard time doing what you did with those papers, and yet if she did not want them read, you did the right and brave thing. I should make sure that something like that happens with some journals and papers I might leave behind. The guy I live with talked about it quite a bit. He was not going to read any of it, and definitely didn’t want anyone else to read it. What if they said something critical? Some people find that irresistible. I would have been hard pressed not to. Thus my admiration for you. The guy I live with says there are things not to like, war, injustice, and so forth, but had the prose been published, like fragments of it, because it’s unfinished, someone would have inevitably said something critical and the guy I live with would have wondered what the point of that was. The unfinished yucca drawing, different story altogether. 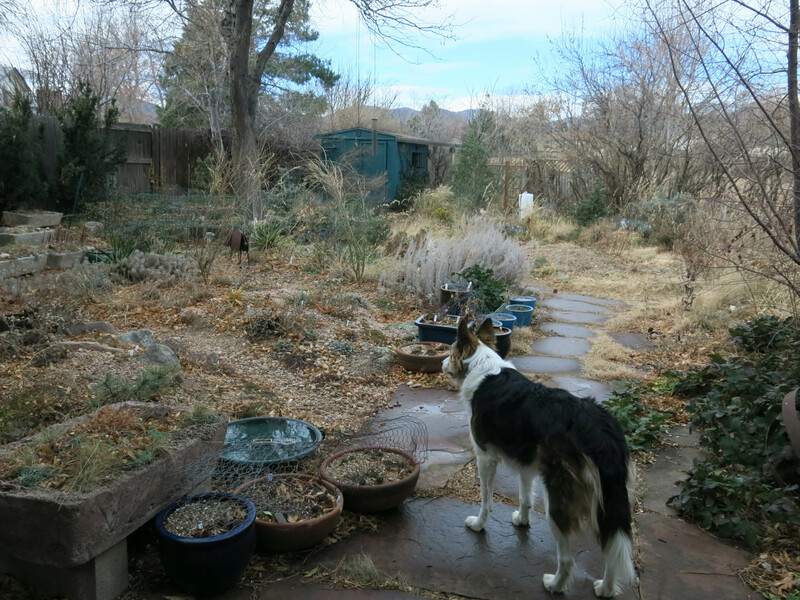 The guy I live with, who, if you didn’t know, talks pretty much constantly, says there are a lot of things about gardens, like other peoples’ gardens, which he does not like at all, but has never felt a huge need to say anything about it, since it would benefit no one.